Fringe Women Artists of Oklahoma, of which I am a member, has a new group art show opening the evening of Friday, Feb. 2 at The Art Hall in The Rise on 23rd Street (519 NW 23rd St., Suite 107). 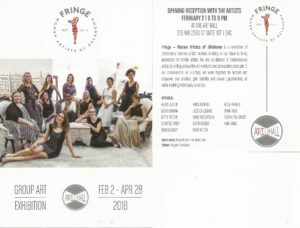 I love the artwork that our members create, and this show looks awesome! I hope to see you at the opening, but if not, the show will be up through April 28, 2018. If you are unable to attend the show, you can still view my artwork and make purchases online through The Art Hall’s website.